There is certainly something to be said for perseverance and luck. Gary Player once famously noted, “The harder I work the luckier I get”! The truth is that this quote has been attributed to several folks throughout history from President Thomas Jefferson to Samuel Goldwyn Mayer…I’m always quick to use Gary Player because he was a golfer and I have seen first-hand how hard work and luck go together on the golf course. This leads me to wonder if any of the above mentioned chaps were turkey hunters; this is where I have to admit that at one point or another over the past four years (including this season) I have spent from one to many nights in pursuit of one wily and very intelligent Tom. I tend to look at failure differently…when I lose a fish, miss a pheasant or get outwitted by a Tom turkey I think about it, sometimes a lot. This thinking can go on for days or sometimes even for as long as a year. What goes around and around in my head is how to not let this same failure happen again…in short, how I can land the fish, shoot the pheasant and successfully harvest the turkey. I don’t say this to sound or act nobler or more caring than others; I don’t like it when the plan fails. I think that at times, turkeys can be a bit evil. They have a sense that other critters just don’t have. I know those of you that don’t hunt are scratching your head and picturing some dumb barnyard animal that stands out in the rain for hours when he could easily take shelter. Others of you that have hunted, let’s just say you have hunted only a few times…and on those occasions have taken a bird are grinning with one of those what the heck looks on your face. Then the majority of us who have hunted over an extended period of time are shaking our heads or at least reading this with a wry smile; agreeing that on occasion these birds can just be flat out fickle. The grandiose bird pictured above in today’s column was just such a bird. Over the past four years this big Tom has given me the slip over and over. 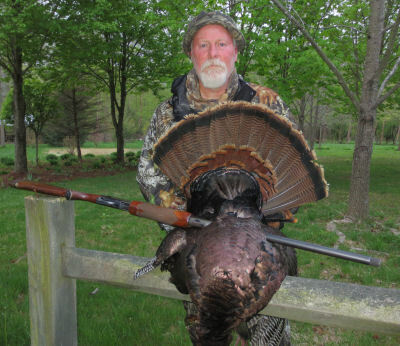 He resides in a field that is about half hay and half corn; each spring he sets up shop about three weeks before Indiana turkey season opens…he struts his stuff and usually to an audience of four to six hens. The said field is attached to two different woods, both large enough to house the flock; this created problem number one because on several occasions when I would park myself and anchor into one piece of timber…he would just follow his gals into the other woods, leaving me with another long and lonely walk back to my truck. It seemed like it didn’t matter which entrance or exit I chose, these birds would come or go the other way. Two years ago I got the wise notion to set up about halfway in the middle, put out a few decoys, get comfortable…and wait. He and his harem would enter the field, feed, flirt and do all the things a turkey does, sometimes getting as close as 60 yards…and then slowly strut away. I tried lots of calling. I tried little calling. I tried coaxing the hens to my decoy and nothing seemed to work. Each of these past three seasons I was able to hunt another farm and harvest a bird each year; so, no complaint…but there in the back of my mind was this bird. How could this bird with a brain the size of a walnut continue to give me the slip? I vowed that this year I would think and watch a lot more before I made a plan of attack. The first night I watched as he and his gals did all the usual stuff and quietly walked through a small grassy patch on their way to roost. A couple nights later I once again slipped into the field, didn’t call or even make a peep…I just watched as yet again the flock of five used the same small grassy runway to leave the field on their way to bed. Could it be? Was this a pattern? I wasn’t sure but Wednesday, April 30th found me passing by the field at about 6pm…and as you might guess, there was Mr. Tom in full strut. He looked like a young Angus calf as he was very black against the new ‘green’ of the hayfield. It didn’t take for me long to change from my school clothes to my hunting garb; I made sure to take the long way around the knob guarding me from being seen or busted by the flock. I took only my box call and gun as I army crawled what felt like a mile but in reality was probably about 400 yards. I had made it to the point that I wanted to be at…now it was out of my hands. Would the birds turn and make their way past me on their way to roost? I realize that you can guess the outcome, but until I had drawn a bead on this big Tom’s noggin…I wasn’t at all confident that things might not once again take a fickle twist. There before me passed hen #1, then hen #2, hen #3 and hen #4; in the following 30 seconds my anxiety level rose to an all-time high as I waited for the boss hog to putter by. Then it happened. There he was. They might have been on their way to roost and probably this bird had strutted while sitting in a tree some 13 or 14 hours earlier…but he was still looking for love as he followed his gals up the hill and through the grass; two times he popped in and out of a quick strut. The sun was casting a soft glow through the grass and I must admit that there was a momentary delay before pulling the trigger as I admired this awesome bird. 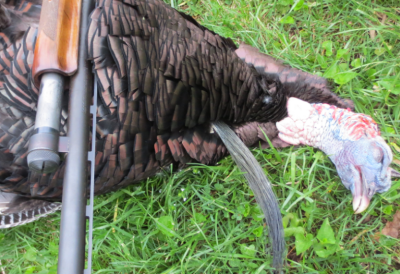 Hard work and a little luck had indeed paid off…in a big way, 23 pounds, a nine inch beard and 31mm spurs. It was a proud moment that some just wouldn’t understand but for me it was yet another reason why I spend so much time Enjoying the Great Outdoors.